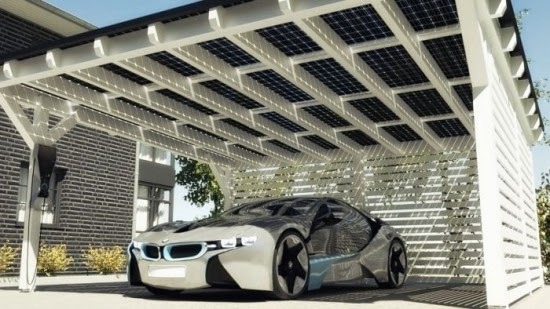 How many solar panels do I need to charge an electric car? Electric vehicles have no tailpipe emissions and you can use solar panels produce clean free electricity to 'fuel' an electric vehicle. That is a powerful combination. When you have both, you can drive on sun miles or "smiles" as they are sometimes called. Your path can start by owning either of them. 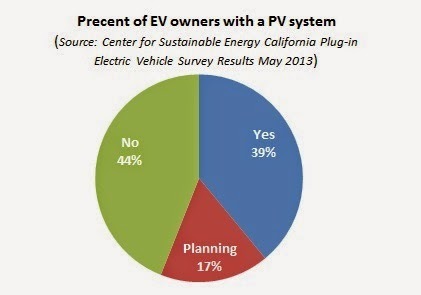 If you own an EV, then you might want to find a way to power it without burning fossil fuels. If you own PV panels, you might be over-producing and look for something to use this extra energy while saving yourself some money by not going to the gas station. Maybe you like clean tech and think both are cool. Whatever the reason, people that have the means and awareness to own one of them are often likely to own, or at least be interested in, the other. If you are thinking about taking the EV + PV plunge, you might want to know how big of a PV system you'll need to power your EV miles. There are a lot of factors to consider. For the EV you'll need to consider: the vehicle, annual mileage, terrain, your driving style... For the PV you'll need to know the direction of your roof, shading, how sunny your area is... I've found some tools that can simplify much of this. This is obviously a gross approximation since I have no idea where on the planet you are. Minnesota will get much less sun than Arizona, and those are both in the US. If you are still reading, I assume a simple rule of thumb is not enough for you. To get a better answer, you'll need to know how much energy your EV needs and how much energy solar panels on your roof can generate. Let's work through an example in detail to see how this works. How far do you drive annually? For this example, we'll use 10,000 miles, since this number is easily scalable. There look up the vehicle in question and note the "kWh per 100 miles" value. You can ignore the range and MPGe values for this exercise. You can adjust these values based on your driving style. If you are lead-foot, add 3 or 4 kWh. If you are a hypermiler subtract a few. Similarly, where you drive matters, areas with steep hills use more energy (even with regenerative-braking) and flat areas will be more efficient (+/-1kWh). Similarly, your climate control use will impact your energy use too. If you usually drive with the climate control or defroster on, add 1 or 2 kWh. Since the EPA numbers are for 100 miles, it is a simple matter to multiple by 100 to get to 10,000 annual miles. So the 2014 Leaf will need 3000 kWh for 10,000 miles and the '14 Model S would need 3500 kWh. If you drive a plug-in hybrid or range-extended EV, do this calculation only for the battery-powered electric miles that you drive. Step 1 was figuring out how much energy your EV needed. Now on to step 2, how much energy can you generate. The LPC value is a good rough first pass approximation. We'll work through the math, but if you get lost in this, there is a link below to a tool that will do it all for you. Q: Solar panel output is measured by kW, but how do you convert this into energy produced (kWh)? Put in the size of the system, the angle, and few other data points and it will quickly run an hour-by-hour simulation for an entire year and show you what your PV's energy production is likely to be. Let's do the same North Bend example with this simulator. Let's say we are putting a PV system on Gino's Pizza Inn at 1324 Virginia Ave. in North Bend, OR. Google maps shows a roof that looks perfect for solar. Put in the address, then a small 6kW for the size, no tracking, south facing (180 degrees), leave the other settings, like inverter efficiency, at their defaults and you get a result of 7,087 kWh annually. The nice thing about this calculator is that it is specific to your region, you can put in your roof pitch, it compensates for how much sun and clouds you get, you can just click the back arrow and change things to quickly compare. For example, if Gino's Pizza Inn were to mount that 6kW system on a dual-axis tilt mount, they would get 9,450 kWh annually. As you can see tracking really helps; it increased the system output by 33%. Now if Gino wanted 9,450 kWh, he can compare the cost of adding tracking, or adding 33% more panels on a stationary roof mounted system. Now you know where to look up the energy that your EV will need (http://www.fueleconomy.gov/) and how to determine how much energy a PV system will generate on your roof (http://www.nrel.gov/rredc/pvwatts/). With these two tools you can pair your EV driving to a PV system and start driving on smiles. Let's complete the Leaf and Tesla Model S examples and see how big of a PV system it would take to power them with sunshine. The 2014 Nissan Leaf needed 3000 kWh for 10,000 miles. 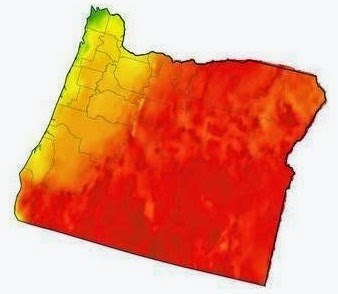 This time let's use a roof mounted PV system in Portland OR in the PV simulator. A 3kW PV system generates 3,016 kWh annually. How does this compare to the rule of thumb from the top of this article? 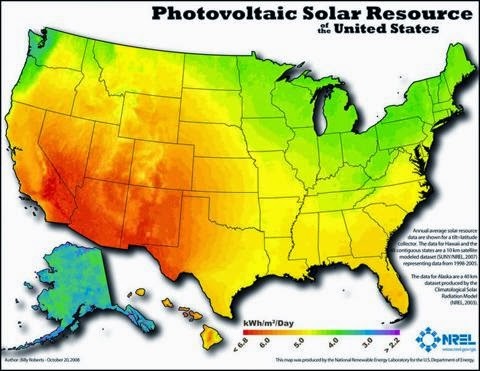 The rule of thumb was each 1kW of PV will get you about 4,000 miles of driving. Portland is not known as a sunny spot, so (not surprisingly) did a little worse than the rule of thumb. In Phoenix AZ, on the other hand, you only need a 2kW system to generate 3,138 kWh annually. This is more than 5,000 miles per kW, so better than the rule of thumb. The '14 Model S would need 3500 kWh to drive 10,000 miles. Let's use two different locations for this PV. Seattle WA would need a 3.7kW system to power the Tesla for 10,000 miles. Whereas Miami FL would only need a 2.7kW roof mounted PV system. I started driving an EV in February of 2007. Later that same year we installed our west-facing 4kW PV system. I hope these tools can help you to become more energy independent and start driving on sunshine. SolarCity has deals to install solar where you pay zero out of pocket and then you buy the energy that the panels produce for less than your current electric bill. If you own a house and this sounds good to you, here is my referral link. Plug Share is a free application that enables drivers to find electric vehicle charging stations near them. The ChargePoint app enables drivers to locate charging stations near them, get directions to charging stations, and see the real-time availability of those stations. Recargo is the EV community powered by you. Find charging stations nearby, plan trips, share photos, and stay connected with news from PlugInCars.com and the Recargo community. Find and help update electric car stations all over the world. CarStations works with manufacturers and drivers to help provide data, latest locations, and up-to-date information.